The Obama administration has led the charge against Jewish settlement construction in the contested West Bank, Israel’s defense minister has said, adding that he hopes the slowdown will be “temporary”. Israeli Defense Minister Moshe Ya'alon said Israel wants to construct more settlements in the West Bank, but an outpouring of global condemnation - spearheaded by the United States - has sidelined those aspirations. 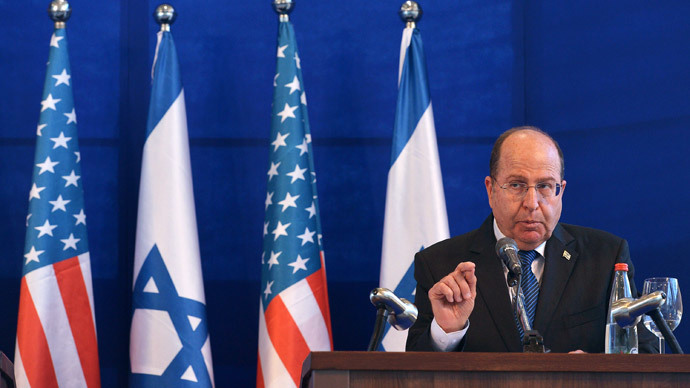 "I really want to approve plans and build more – right now this issue provokes a reaction first and foremost from the Americans, and then threats from various sources," Ya’alon said, as quoted by Haaretz, on Tuesday addressing high school students in a Jewish West Bank settlement. The comments, also broadcast on Israeli Army Radio, may further strain relations between the government of Prime Minister Benjamin Netanyahu and the Obama administration. In October, top-ranking officials in the Obama administration, including Vice-President Joe Biden and Secretary of State John Kerry refused to meet Ya’alon during a visit to Washington. The snub should not have come as a surprise, however, considering the Israeli minister had earlier been quoted in Israeli newspaper Yedioth Ahronoth as accusing Kerry of being "obsessive and messianic" in regard to his strenuous efforts to broker a peace agreement between Israelis and Palestinians, an elusive objective that has evaded US leaders for decades. The human rights group Peace Now said that while there have been no new settlement projects since a meeting between Obama and Netanyahu in October, the construction of previously announced housing continues, AP cited the group as saying. Israel attracted the criticism of the global community when it accepted tenders - shortly after a 50-day conflict in the Gaza Strip that left some 2,200 people dead, the majority of them Gazans - to construct over 1,000 new settler homes in East Jerusalem.